The impossible stairs that can be climbed and descended moving in the same direction, famously drawn by the Dutch graphic artist M.C. Escher, did not just stem from his imagination. They were inspired by the staircases in his old high school in Arnhem, Holland, as Claudia Kammer of the Dutch newspaper NRC Handelsblad (€) now reveals. 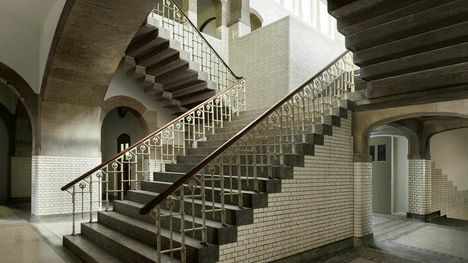 Micky Piller, curator of the The Hague Escher Museum recently discovered that architectural elements from Escher’s ‘impossible worlds’, like the prints Other World (1947) and Relativity (1953), contained many features of the stairwell of Escher’s old secondary school. “Until now, scholars thought that Escher had stopped drawing from nature in 1935, when he left Italy. They assumed he switched from drawing landscapes to mindscapes,” Piller says. Those mindscape pictures, his depiction of impossible worlds and infinity made Escher (1898-1972) a world wide famous graphic artist, admired by millions. “It was not all imagination, we must conclude now,” says Piller. Last year she got a call from a former teacher at Escher former high school, who invited her for a tour in the old school building. “You will be surprised how much from Escher you will recognize, he said – and he was right.” The stairways, the arcades, the white tiled walls, it was all there. “Escher loathed the school. He attended it between 1912 and 1918,” Piller says, “and failed his exam. He called it the hell of Arnhem. He only liked the drawing lessons.” But after World War II, when he was already an established graphic artist, he was asked to make a memorial mural for the pupils of his school who were killed during the war. “He saw the possibilities of the school architecture, especially the stairwell, with fresh eyes then,” says Piller. What seemed boring during his schooldays now inspired Escher. Famous woodcuts and lithographs like Other Worlds and Relativity date from after his visit to the school. The staircase at the former Lorentz HBS building in Arnhem. Photo: Studio Gerrit Schreurs. 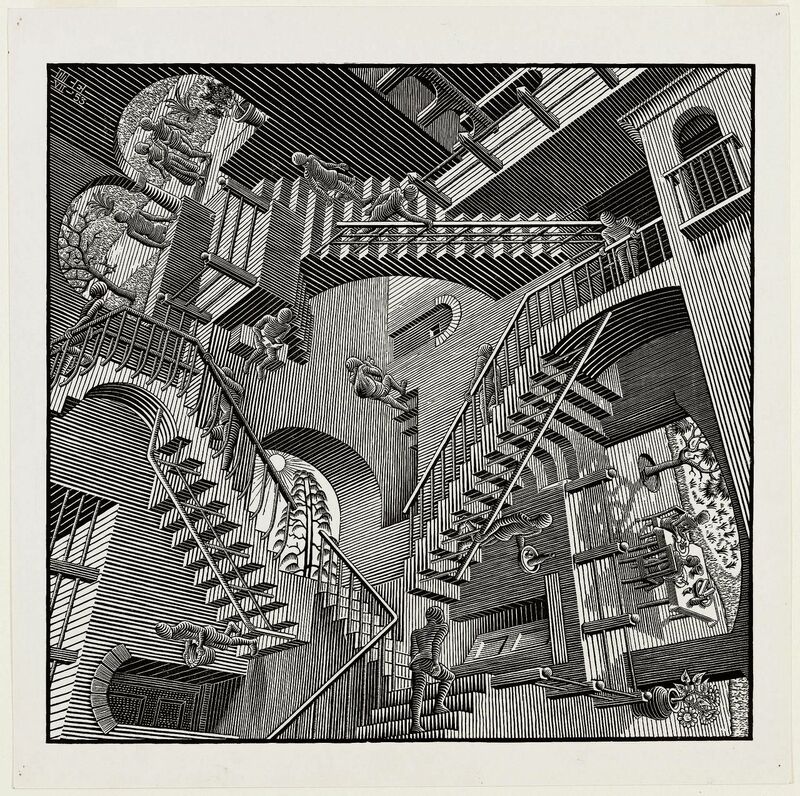 The Escher museum in The Hague, Escher in het Paleis, now shows Piller’s exhibition about this discovery: A Sense of Wonder, from boredom to optical illusion: inside the adventurous mind of a teenager. Eschers former secondary school in Arnhem was built in 1905 and designed by G. Versteeg, an architect inspired by the Amsterdam School architecture style. The school was named after a famous former pupil, H. Lorentz, who won the Nobel Prize for physics in 1902. The Lorentz high school is now a monument and used for housing students.